Vintage Stores in Austin: Reuse to Decorate Your Home! Call or TXT 7 Days a Week! Get Your Free Apartment Search! Shopping vintage stores in Austin is a great way to save money! There are a lot of vintage stores in Austin. Read on to find out where you can find used furniture and housewares in Austin. That way you can decorate your apartment on a budget! This is the best of the vintage stores in Austin. They have furniture, lighting, home decor, clothing and more! Best of all, their stuff is well-priced. They are constantly adding new stuff, so if you see something, nab it. Follow their Instagram account to see items first and place a hold if you have to have it! This is quite possibly the most expensive of the vintage stores in Austin. However, they have iconic restored mid-century modern pieces. Even if you’re on a budget, it’s worth a visit just to see their amazing credenzas, chairs, wall units and more. This is still one of the coolest vintage stores in Austin, even after a recent move! Choose from vintage items by 24 antique sellers all under one roof. If you’re lucky, you might find a one-of-a-kind piece for your home! Austin Antique Mall has 30,000 square feet of different dealers selling just about anything you can imagine. There are items in every style, from shabby chic to mid-century modern and more! Plus, they’re right next to Playland Skate Center. Go ahead, stir up some vintage memories of knocking them dead on 4 wheels at the skating rink! Probably our favorite customer photo thus far, but then again we do have some sentiment attached to this tulip set that graced our own home for over five years before we went in a different direction and brought it to the store for re-homing. So happy to see it being loved. Send us pics of your Rave On purchases! 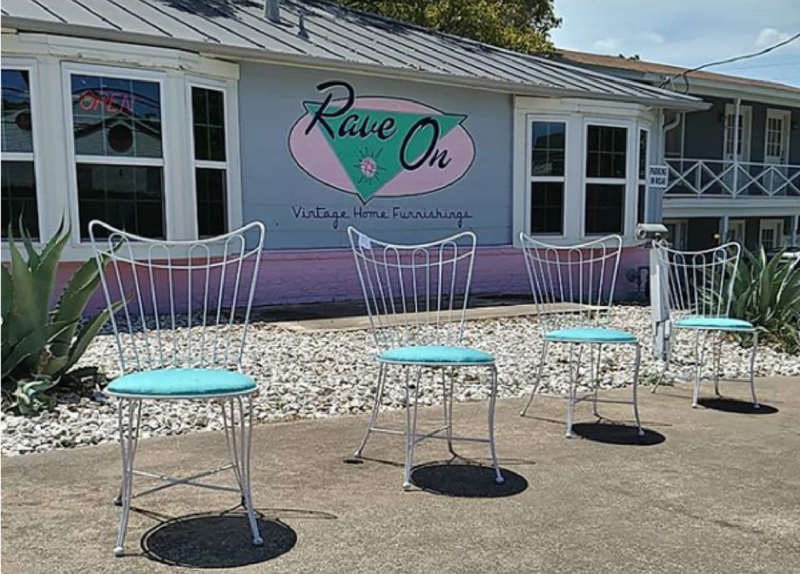 Housed in an old house in Allandale, Rave On specializes in mid-century modern decor. They have a lot of turnover, but you can browse an updated inventory list on their website. Prices here are higher because Rave On only stocks high-quality pieces in excellent condition. Want a new apartment to fill with all these vintage goodies? Our apartment locator services help you find a new place in no time! YES! I'm ready for a new pad! Your Perfect Apartment, Coming Right Up! Tell us about your dream home in North Austin! Where can we text apartment options? Where can we email apartment options? We put them all on FB & Insta! Follow us and don't miss out!